Talking to Greg Nolan is a bit like entering the eye of a tornado--there’s a whole lot of turbulence and confusion until you get to the calm center where you begin to see the world from his perspective. Greg is a dynamo of energy and initiative with 80 acres and the Snowy Pines Reforestation business in Minnesota, which he manages with his wife, Marcia Rapatz. He’s the type of guy who always has five irons in the fire. 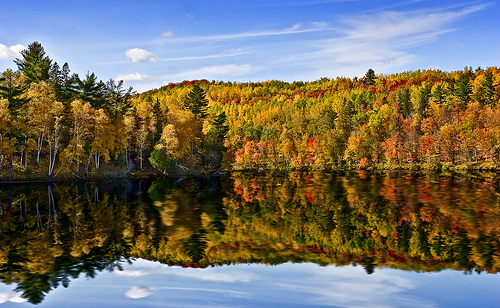 I was referred to Greg by Lindberg Ekola, Landscape Program Manager at the Minnesota Forest Resources Council. Theirs is a mutual admiration society. 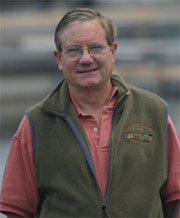 Greg has been a member of the West Central Regional Landscape Committee since its creation in the year 2000. “If we empower ‘forestry with a small f,’” Greg says, “we will get way more jobs, more innovation, more independent critical thinking, more freedom, more inspiration, more democracy, more resilience, more passion and more of all the things we need to accomplish. We as a society are too good at planning and not good enough at implementation. We plan to plan. I want to implement! Greg is in the business of processing blowdown and salvage to make wood flooring, furniture, or wood trim. He has a solar powered warm-room kiln for drying the timber, and he knows very well how to estimate the return on a tree. Greg has even written an article in the April 2010 edition of Sawmill and Woodlot magazine entitled “The $4750 Tree.” He describes a single ancient but unsafe white pine that he processed into 1500 square feet of beautiful siding. “When I cut a dead oak, I’ve had the experience over and over again that when I’m done, it’s worth a couple thousand bucks, at least," he points out. Greg maintains that many more local jobs could be created if "small f" wood is processed locally and sold in the retail markets. “I started doing ‘40 Points of Light’ on my land by taking a chainsaw full of gas and heading off in a chosen direction to work. What I did was skip the intensity of traditional timber stand improvement in favor of saving the trees, every 30 to 40 feet, that had the best potential. What I have today is a wonderful crop of well-spaced, high value trees, with pulp and junk trees filling the voids. The junk trees turn into wildlife trees and firewood, but in the mean time my quick work with a chainsaw has given the crop trees enough light to develop. “It’s a way to solve a problem by injecting time when you are low on resources. I like to use time as a tool. Too many of us see it as an obstacle. “Some folks think that stewardship plans simply inventory private timber for ‘Forestry with a capital F.’ Eighty to 90 percent of the land in our area is managed by the "hand of God" (Mother Nature), and this includes people who have current stewardship plans. You see, landowners do not like clear cuts or sloppy loggers. “Many people are interested in caring for their forests with a light hand on the land and are put off by the tools the forestry community has offered them over the last 40 to 50 years. Those tools include pulp woodcuts and even-age managed forests whose management cycles always seem to end in a clear-cut. Another example of Greg’s initiative is a tree-planting program he helped establish. Over the course of a five-year time frame, Greg worked with 40 private landowners to restore riparian habitat along the Long Prairie River. They planted 60,000 trees.